For her 600-word review following the writer development workshop at Birmingham’s Ikon Gallery, Jessica Ramm chose to write about Edmund Clark’s exhibition. For the exhibition ‘In Place of Hate’, Edmund Clark offers up the culmination of his three-year residency at HMP Grendon, Europe’s only wholly therapeutic prison. Making use of a range of found objects, photography and film, he presents a series of interconnected spaces that retain something of an institutional atmosphere. Grendon’s prisoners have chosen to participate in its democratic therapeutic community and many of Clark’s objects allude to the anxiety and fear they must overcome to break free from repeating victim-perpetrator cycles. A circle of soft-upholstered chairs occupies the exhibition’s central room lending it an expectant air, as though group therapy is about to begin. Hung on the wall is a tube map displaying coloured lines and corresponding intersections and stations. This must be a wry joke: an escape map for the incarcerated. The functional simplicity of this design is immediately recognisable to anyone who uses London transport, but the routes and stations plotted describe a journey fraught with peril. ‘Personal Development Pathways 2011’ leads to three ultimate destinations: ‘life’, ‘suicide’ or ‘lifelong personality disorder’ via stations such as ‘bullying’, ‘remorselessness’ and ‘alienation.’ The thought of passengers hurtling through these dark tunnels towards salvation or damnation is an uncomfortably literal metaphor for the struggle between free will and fate. Cube monitors perched on two of the chairs display a filmed psychodrama response to Aeschylus’s Oresteia, a Greek Tragedy that deals with themes of revenge and moral responsibility. 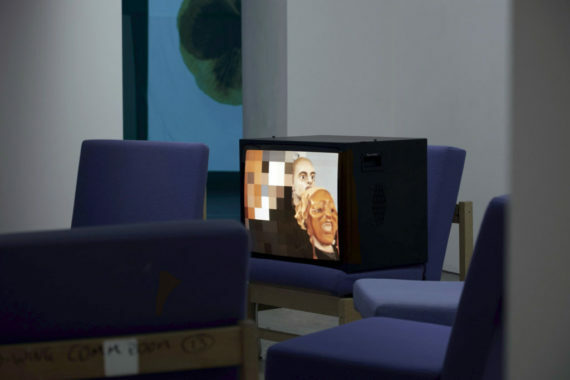 The film, Oresteia (all works 2017), shows both prisoners and supervising staff as masked actors voicing their parts in a sparsely furnished room at Grendon. Where the prisoners are depicted through film or photography, their identities have been blurred or pixelated, in line with censorship rules enforced throughout Britain’s prisons. During his residency Clark used a pinhole camera to make a series of portraits of prisoners while they answered questions about their criminal and personal histories. In the installation My Shadow’s Reflection these hazy ghost-like portraits are projected onto pallid green banners made of sheets taken from the prisoners’ beds. The obvious connotation is of nightmares populated by restless phantoms, but it’s less clear to whom these nightmares belong. Gathered together in the publication that accompanies the exhibition, the written interpretations the prisoners make while reflecting on these self-images are harrowing: stories of childhood trauma and abuse, fear of abandonment and self-loathing. Their images are redacted partly to protect victims from the possibility of a traumatic encounter with an attacker, but their specific acts of transgression have been smudged out along with their features. Their indistinct outlines are too fuzzy to align with vehement labels such as ‘monster’ or ‘murderer’, so often used by tabloid papers. Clark’s images reflect fear of an archetype rather than a single perpetrator, and this is a phantom that can’t be outrun. Surveying the prisoner’s personal testimonies and personal effects in a gallery context raises ethical questions. It would be easy to adopt an anthropological gaze that could alienate or dehumanise the prisoners further, but since all specific information that might identify them or the nature of their crimes is withheld, there is nothing solid about these ghosts – nowhere for assumptions to lodge or for preconceptions to take hold. Instead, Clark presents a space in which the passage to the act of transgression must be considered, but also the courage and determination of prisoners who are being taken apart and put back together again within Grendon’s therapeutic community. ‘Edmund Clark: In Place of Hate’, Ikon Gallery, Birmingham, 6 December 2017 – 11 March 2018.